In “The Art Museum: History, Philosophy, and Practice,” a course offered annually in the fine arts department, undergraduates examine the idea of the museum going back to its Greco-Roman beginnings; they explore contemporary issues in museum management such as collection ownership and audience; and they participate (contributing research, for instance) in the development of a McMullen Museum exhibition. This year’s class has focused on the upcoming show Dura-Europos: Crossroads of Antiquity, which will describe the multi-faith character of that ancient city in what is now Syria. The exhibition is being curated by Gail Hoffman, assistant professor of classics at Boston College, and Lisa Brody, associate curator of ancient art at the Yale University Art Gallery. It will feature works from Yale’s extensive collection of Dura-Europos paintings, sculptures, and objects of daily life. 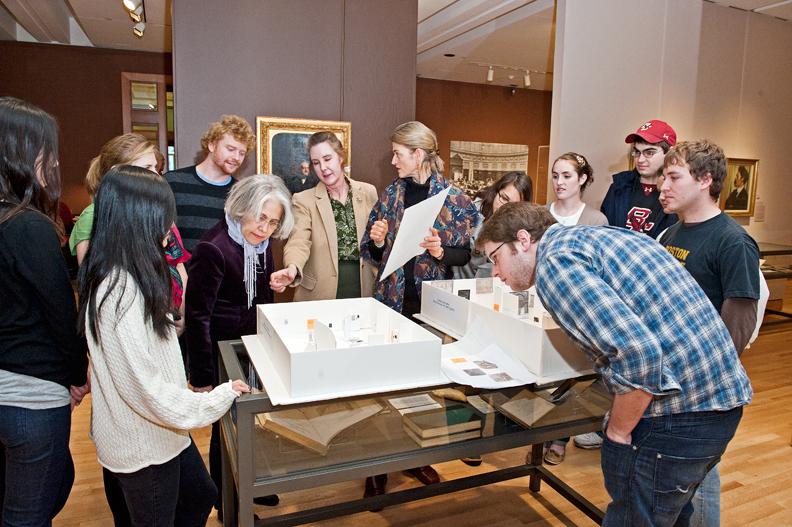 On November 29, members of the class studied plans and models for the show, which will run from February 5 to June 5, 2011. They were joined by (center, from left) professor Nancy Netzer, director of the McMullen Museum, and Hoffman, who co-teach the course, and Diana Larsen, the museum’s exhibitions designer. This feature was posted on Thursday, December 9, 2010 and is filed under Featured Photo.